For me, summertime means water. I was fortunate enough to grow up in a town that sits on the shore of Lake Ontario and is divided by a river big enough to handle decent sized ships. My family also had a summer cottage on a nearby bay so fishing, water-skiing, swimming, and boating were a huge part of my life. Water safety was ingrained into me as long as I can remember. Learn to swim. Since I grew up swimming, I am always amazed at the number of adults who do not know how to swim. The best thing you can do for your child is learn to swim if you don’t know how. Just like putting the oxygen mask on yourself first in an airplane emergency so you can help your child, being able to swim puts you in the best position to assist your child if they get into trouble in the water. You don’t have to be able to do every stroke, swim a mile, or even look good doing it. You should be able to tread water and cover a couple lengths of the pool with a basic crawl. Confidence in your own ability will allow you to make better judgment in an emergency. Lessons for adult swimmers are available at most YMCA programs and some city/town pools. Take the opportunity to learn a new skill. Make sure your children learn to swim. I taught my oldest when he was about 3 or 4. Children this young (and even older) are not mature enough to be considered safe on their own, but swimming gives them a chance to learn useful skills and to overcome any fear of the water. Swimming lessons are a great investment at a facility, but there are other options. My brother’s family had a pool and they pooled together with a group of friends whose kids were about the same age, hired an instructor and got together once a week for lessons and a cookout. The adults got some social time, the kids all got lessons together and it was a good time. I know other people who have done the same thing and it’s often a reasonable cost. Always wear a Coast Guard approved life vest when on open water-whether you can swim or not. There are several different types so find the one that is comfortable for you and your kids. Make sure they still fit each year as kids grow fast! My own son, in a moment of brilliance, grabbed a branch from an overhanging tree while my husband was rowing him around in a small boat. I’m not sure what Andrew thought would happen, but he didn’t let go and slowly got dragged out of the boat. My husband had his back to him as he was rowing, so didn’t know this was going on until he heard the splash. Luckily, the water was shallow so Andrew could actually touch bottom, but it was also in April when the water was still quite cold. My husband was able to promptly get him back in the boat for the cold row home, but had he been by himself, the cold could have prevented him from getting back in the boat or to shore or he could have lost consciousness. 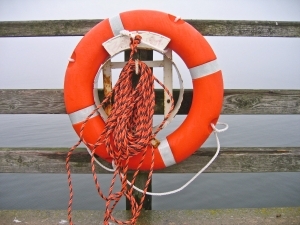 A life preserver gives additional time for rescue. Follow pool or beach rules. No running, diving in shallow water, pushing etc. When I worked in a clinical setting, there was a seasonal pattern to spinal cord injuries. Fall was people falling out of tree stands during hunting season and summer was diving accidents. I hate that so few pools have diving boards available anymore, because of liability issues – but they are quite honestly just so fun! Diving into shallow water is too dangerous. In open water, you need to be aware of drop offs, currents, submerged hazards, wildlife (thank you to the sharks and seals off the Cape), and things like boats and jet-skis that share the water. If a lifeguard orders you out of the water, comply. If the warning flags are out, there is a reason. Look at the big waves, don’t play in them. NEVER SWIM ALONE. Even my teenager knows the rule that he is not allowed in our swimming pool when no one else is home. This is as true in a pool as in open water. Teach kids the buddy system and make sure they follow it. 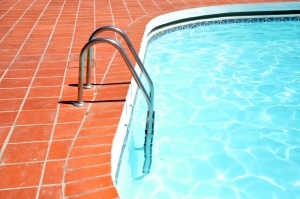 If you own a pool, make sure it is properly fenced with a latch that is high enough off the ground to prevent children from opening the latch. Keep the water clear enough to see the bottom. Our pool is difficult to secure properly due to the way it is adjacent to the house. I’m sure it would never be approved today, but is grandfathered in regarding building codes. Because we have doors from the house that lead directly to the fenced pool area, we also have a pool alarm that alerts us if anything bigger than a few pounds falls in the pool. One of my dogs has pushed our beagle in twice (though his look says it was an accident, I’m not so sure) so it also protects pets and other creatures. During the off season, the pool has a cover that is strong enough to hold an elephant, supposedly. I can’t vouch for that, but it does hold a 50 lb dog. You don’t want a child to try walking across it and fall in. Educate your family on what to do in an emergency. Even young children can learn about 911. Encourage adults and older children to take available classes in water safety. 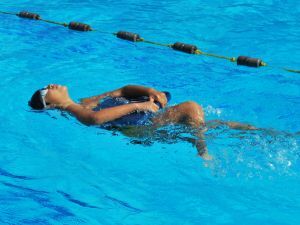 You don’t need to become a lifeguard (though it is a great way for older teens to get a job and good for anyone to do) to learn basic rescue techniques. Don’t go into the water to help someone in trouble unless you are trained. Use a pole or a towel or even a pool noodle to extend reach to a panicked swimmer rather than your own hand. In open water, use a human chain if appropriate. Call emergency personnel first. When I was growing up in New York state, you had to pass Health to graduate high school and part of passing Health class was learning CPR. I still think that’s a great idea. CPR and First Aid classes are another great investment. The new CPR guidelines are easier to remember than the old ones and the class is one day. Call your local American Red Cross or hospital for schedules of classes. Apply Sunscreen. Being pale and pasty myself, I feel the need to remind everyone. Apply it, apply enough of it (a shot glass full) and apply often (after sweating a lot, swimming etc). 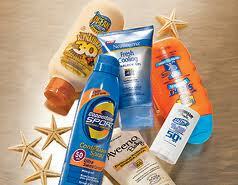 The risk of skin cancer increases dramatically with just one sunburn in childhood. Plus, sunburns make kids cranky…reason enough in my book. The water and all the many activities can make summer more comfortable and a ton of fun. Keep it safe and it will give you memories to last a lifetime!